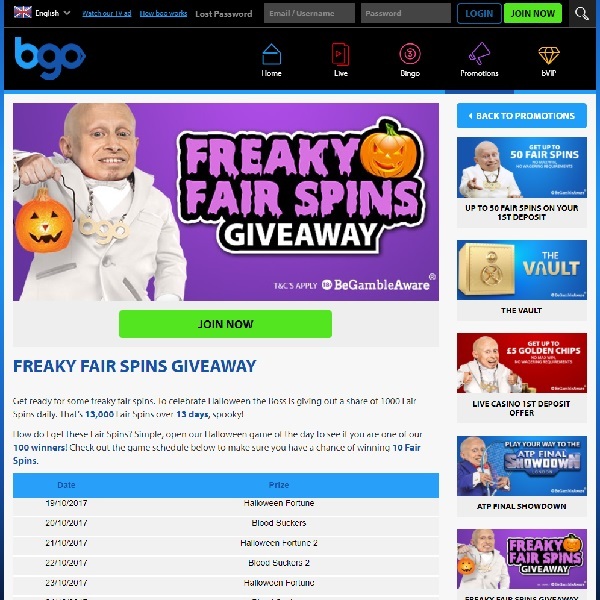 To celebrate Halloween BGO Casino is giving away 13,000 free spins between now and the end of the month. To qualify for your share of the spins all you have to do is open the chosen Halloween game of the day to see if you are one of the 100 daily winners. The selected game changes every day, today it is Blood Suckers, tomorrow it will be Halloween Fortune 2 and then on Thursday it will be Blood Suckers 2. This is a great chance to win some spins just by playing a few quality themed slots. With a bit of luck you’ll win loads of free spins and they could go on to provide you with masses of winnings. Make sure that you don’t miss out, head over to BGO Casino and see if you are one of today’s winners.